Incredible views can be seen from this spacious 3 bedroom, 3.5 bathroom luxury condominium. 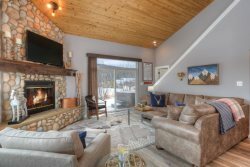 Beautifully decorated with exceptional finishes and located just across the street from Big Sky Resort. This condo is ideal for year-round vacations to Big Sky and Yellowstone National Park. The condo is seconds away from the Big Sky base area and some of the biggest and best skiing in America: access to more than 5,500 acres of terrain, 24 lifts and 220+ trails. During the summer, the condo is minutes away from hiking, mountain biking, horseback riding, golf, river rafting, fly fishing and more. Yellowstone National Park is only 45 minutes away. This is truly nature’s playground! This vacation rental is a 2476 sq.ft. condo with private entrance, single floor plan layout, and 3 private patios with amazing views of Lone Peak! Garage parking for 2 vehicles (Additional parking in parking lot out front of building). The fact that a reply to a question is in your email within an hour or two is the best. Nothing worse that having the hopes of renting and waiting days for a response. This is real-time here! Its like your chatting all the time. VRBO, Beehive Management, a truly 5 start rental made our ski vacation the best we ever had. Looking forward to our 2019 stay knowing what we know- it will be the best again!! Amanda and Travis were both very helpful and a pleasure to meet! Best accommodations ever! Only disappointment was the length of 1 hour and 10 minute drive to the west Yellowstone entrance, but, it is a beautiful drive! Excellent property with convenient location. I actually stopped in at the Beehive office to visit with Britney and Amanda. And Penny. Both were very friendly and were very good at getting back to me with any issues i had. Beehive was great. Answered all of our questions quickly and were readily available when needed. We loved our unit and the view was incredible. We also loved the location which put us about 5 minutes away from the slopes. The condo is very "Montana Luxury." It has a very cozy feel, and contains everything a family would need. We used both the grill and the hot tub - definite benefits! It's close to downtown Big Sky and across from the ski resort - stores and restaurants plentiful in both areas. We loved being close to a variety of hikes and only an hour away from Yellowstone. Our family of five enjoyed our stay a ton!